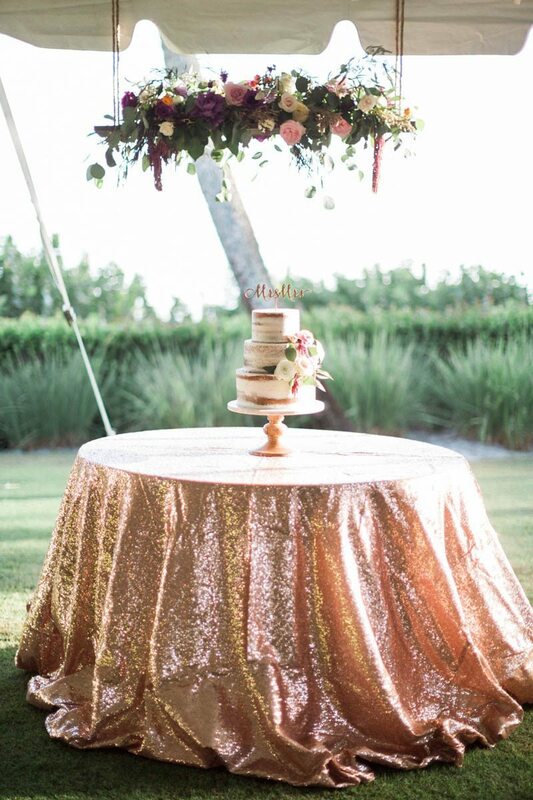 Going along with our blog series on wedding styles, we would like to introduce you to boho and boho glam. 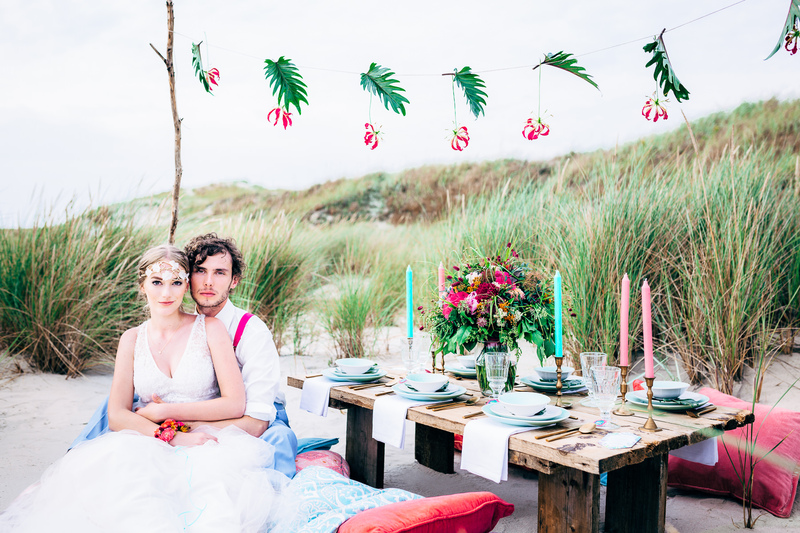 Below you can learn what those two styles are all about, where the differences lie and how you can incorporate bohemian into your wedding. Enjoy! 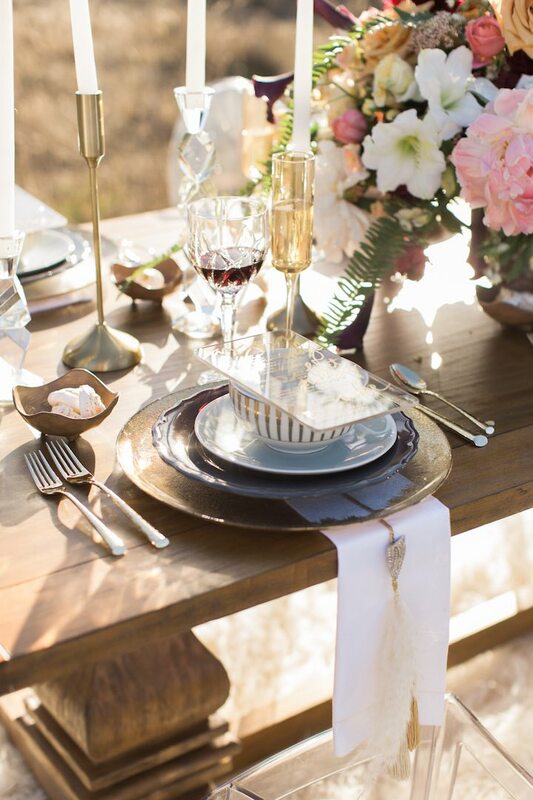 Boho or bohemian stems from the time of the French revolution. It describes artists of the middle class who shared a fascination with the orient and were revolting against the system of society. The individual became a piece of art through carefully choosen attire and natural accessories. The boho style as we know it today fits free spirits and earth children perfectly. 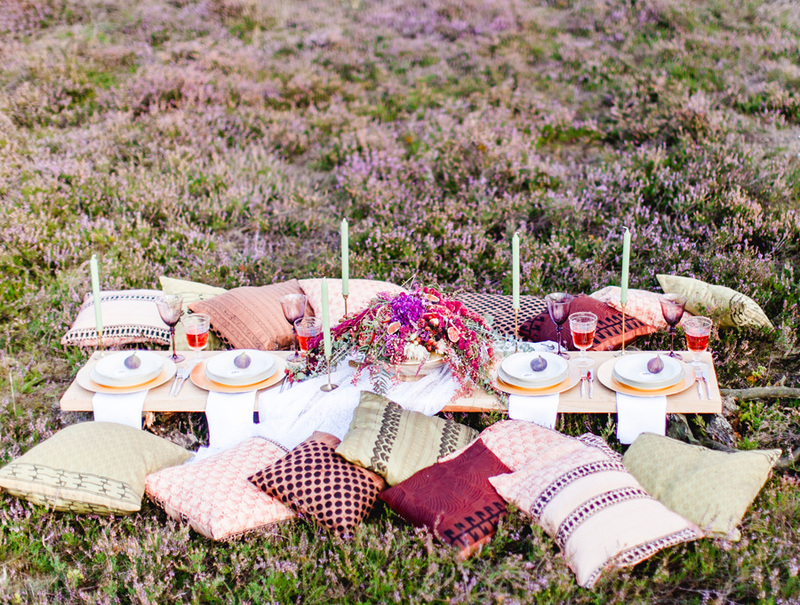 If you are looking to incorporate your own personal individuality into your wedding, boho is exactly right for you. Its is a bit more rustic than boho glam, because here everything is about creativity, ingenuity and revolting against the ordinary. You should be layed-back and not afraid of bright, loud colors. Berry tones in particular are typical for boho. They are combined with browns and greens. Instead of a carefully choosen and assembled bridal bouquet you can use wild leaves and flowers that look like they have been picked on a maddow. Your dress is a statement in itself. It may come with chunky lace, flowy little sleeves or ethno patterns. Inspiration for boho dress you may find at Grace Loves Lace, lover’s society, Rue De Seine orImmaclé. An effordlessly beautiful make up fits with the bohemian look. You may wear your hair down or loosly done up. A wild and free braided style fits perfectly with the look. Rustic feeling barns, nature itself or a tipi make for the perfect location of a bohemian wedding. They allow you to go all out with colorful decorations as they possess a variety of possibilities for styling. Multicolored throw-pillows, oriental carpets or bright ethno prints, you may combine away much as you like. Especially characteristic for bohemian style are feathers accessorizing your dress, hair or your bridal bouquet. Another elements are cussions with patterns that cozy up in a tipi thus also functioning as the wedding backdrop. And don’t forget to all dreamcatchers that dangle from a tree and collect the memories of your most beautiful day ever. 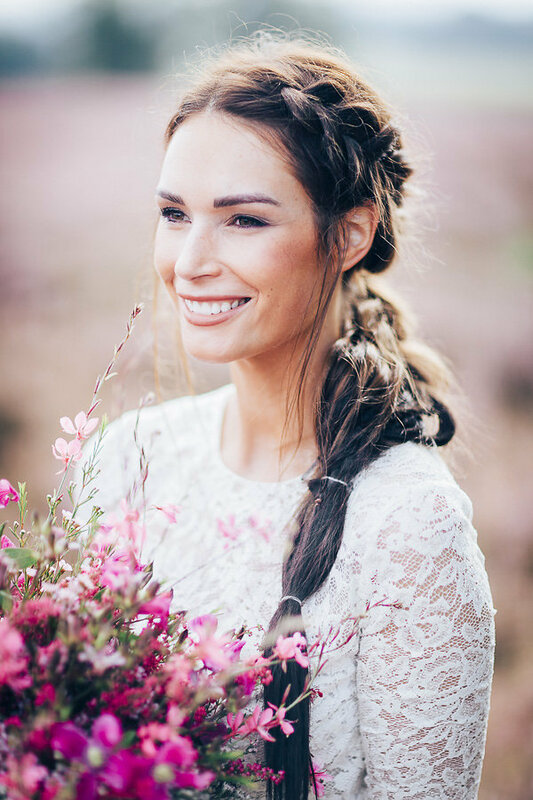 In styling your boho wedding you have all the freedom you would ask for. 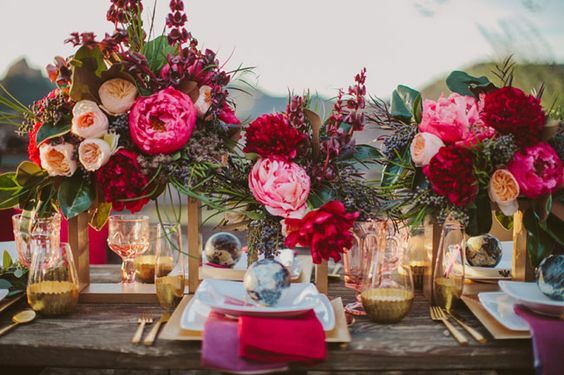 From fairy lights that wind themselves around trees, to colorfull table ware or succulents that become part of your centerpieces, everything that has a hippie feel to it work. The details you choose will make your wedding super special. Here is another idea: Why don’t you invite your guests to take off their shoes? It adds to the layed-back atmosphere and will certainly be a welcome change for the high-heel-wearing ladies. 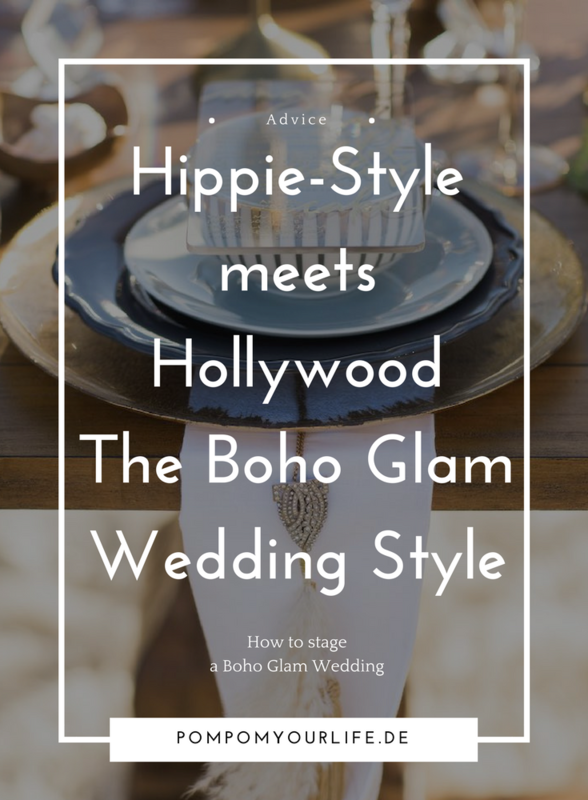 If you are wild at heart, your styling is a bit hippieish but the hollywood glam factor should definitely not be missing from your wedding, boho glam is perfect for you. It is an electric style which links old hollywood with hippie charm. At the first glance boho and glam may be two polar opposites and their mix might seem strange. But trust us, through witty combination of elements from both styles, something as extraordinary as unique will emerge. And it is quite easy too. Just combine sparkly crystal glass with a frame of driftwood. What also works is to stage objects in a different than their usual purpose. For instance whine glasses as candle holders. 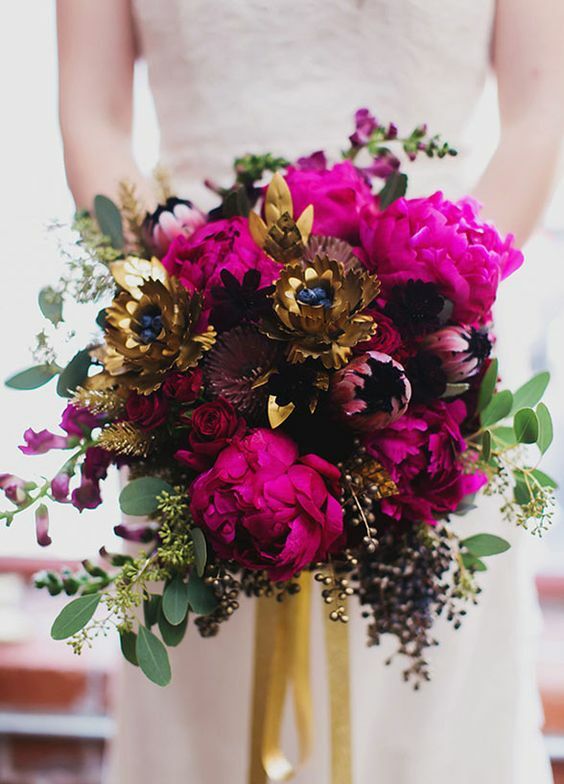 As in boho your bouquet can consist of fresh green leaves and colorful flowers. It will just be a bit more elegant. It less resembles a maddow and its also not as wild. Instead english roses and peonies have their chance to shine. Couture fashion meets hippie chic – This is what you should keep in mind when it comes to choosing your bridal dress. As with boho, chunky lace is often used. Deep, interesting necklines go along with it. Sometimes we even see playful cuts. Get your inspiration from Galia Lahav, Gala 904 or Gala 906. With bohemian glam it is also possible to wear your hair down, loosely done up or in a fancy braided version. Boho glam hairstyles are just overall not as wild as the bohemian ones. Here elegance is more in focus. 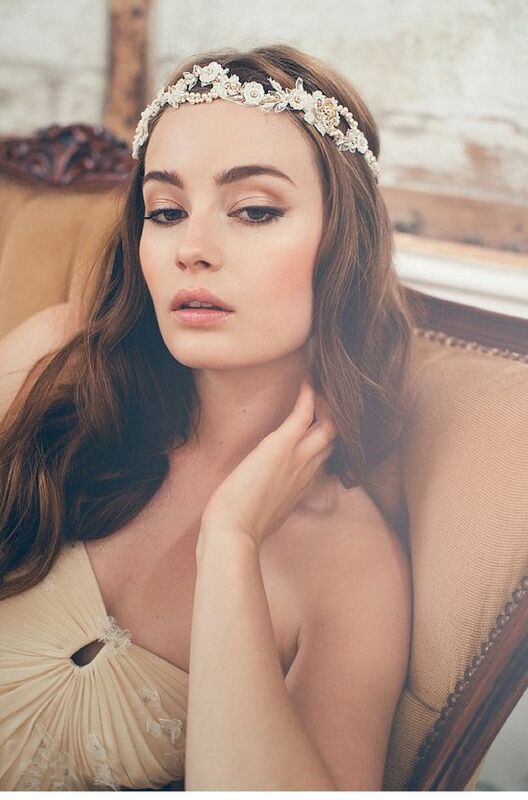 To give your hair more extravagance you can for example add a headpiece by Jannie Baltzer. High ceelings, lots of windows and magnificent candeleers can transform even a rustic barn into a glamourous venue. But also a party tent can serve as a location. The styling is more opulent and elegant than the classic boho look especially because of metalic elements. Nevertheless boho glam is relaxed and unconventional. 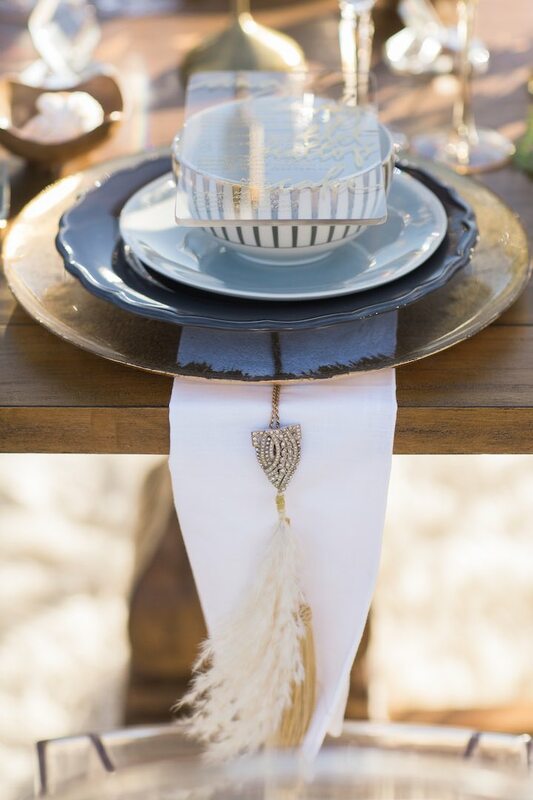 A sequin table cloth, velvet table runners, crystal glasses, wicker or peacock chairs, fur and brass candle holders are objects that bring about the boho glam flair. 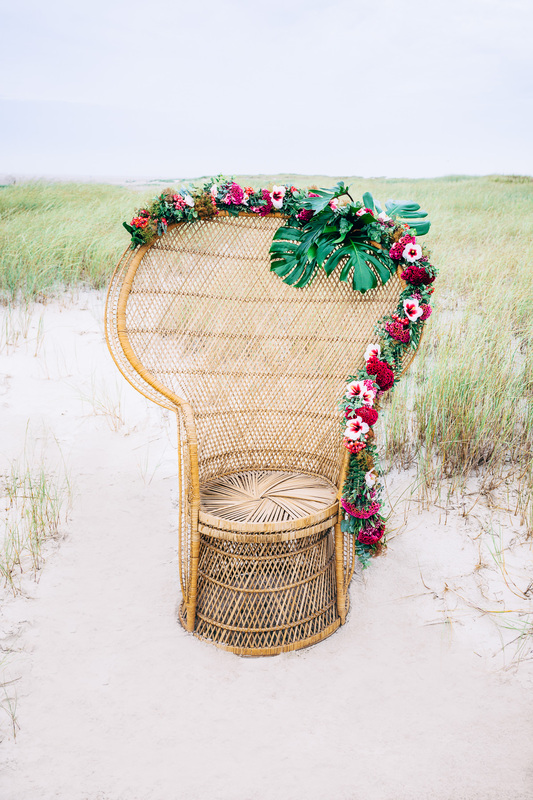 The iconic peacock chair dating back to 17th century southern Asia will most definitely take your boho weddings glam factor up a notch. The key is to combine it with white, black or grey sheepskin. If you are more into floral elements, those can be added as well. 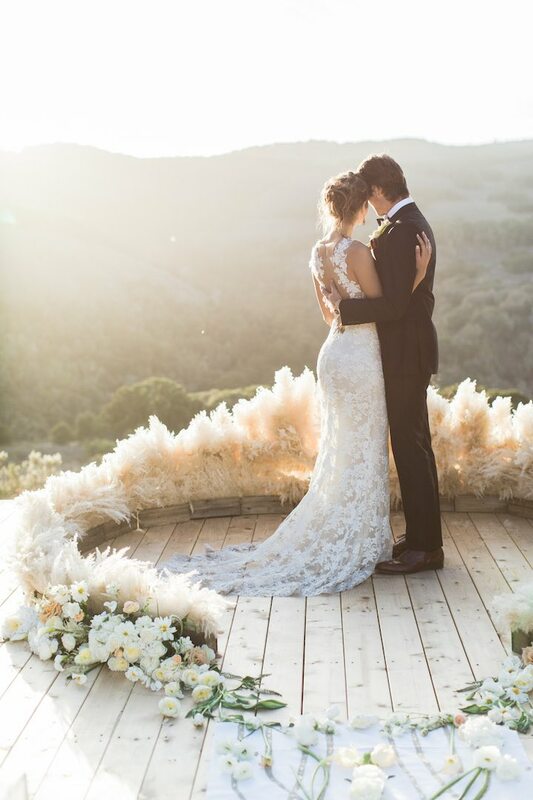 Throw in a silk pillow and peacock chairs become a perfect seat in front of the altar for you and your husband. Now you can be wed in full bohemian glam. Take a look at our board over on Pinterest, for more inspiration on boho and boho glam. If you’d like to stage pampas gras, look at this board. Do you prefer boho or boho glam? 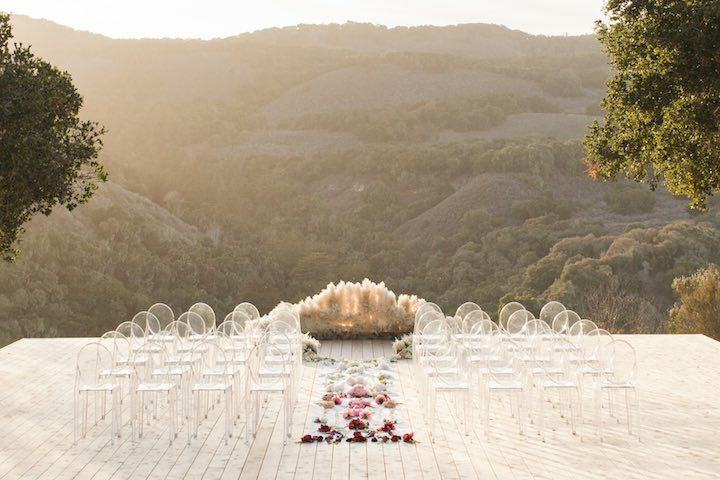 Would you use one of those styles for your own wedding? Please share your thought down in the comments. We are very curious about what you think! Looking for another wedding style? 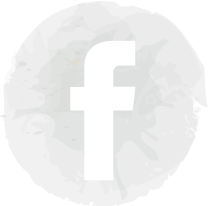 You may find lots of information on all kinds of styles over in our overview-post Our most beautful wedding styles.